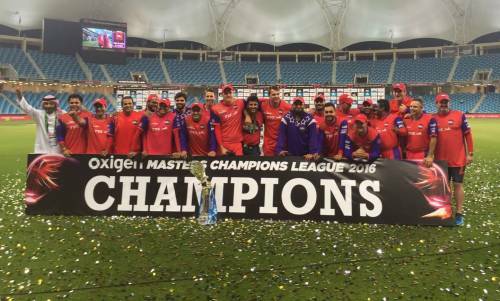 Virender Sehwag led Gemini Arabians defeated Leo Lions in final of the inaugural Masters Champions League by 16 runs at the Dubai International Stadium. A match full of fluctuations saw Arabians emerging as the champions as they defended the meagre total of 130 runs by bowling out Lions on 114 in 19.3 overs. After winning the toss, Lions captain Brian Lara decided to field first in what looked like a dusty track with the sign of bounce keeping low. He was rewarded for his decision very soon in the match as Robin Peterson got in-form Sehwag stumped in the 4th over of the match. Opener Richard Levi made 21 off 29 deliveries and gave Kumar Sangakkara support in his 30 runs innings. When both the batsmen started taking risks, Kiwi's all-rounder Scott Styris caused a double blow by sending Levi and Sangakkara back into the dugout. Justin Kemp's late fireworks ensured Arabians will have a respectable target (131 runs) to defend where he scored 32 runs which included two sixes and one boundary. Lions lost their first wicket on the third ball itself when opener Neil Carter was caught at the mid-off area by Sehwag while trying to drive Kyle Mills' full delivery. The other opener, Hamish Marshal, was the top scorer of the match with his 40-ball 46 runs, but couldn't take his team home as Saqlain Mushtaq made him pay for going on the back foot to play his sharp turning ball. The wickets kept falling on the other end. Brian Lara tried to rescue team from the collapse, but he became target of Naved-ul-Hasan's hat-trick delivery and was clean bowled by the in-swinging (unplayable) yorker. And that moment changed the match forever. Hasan's hat-trick came at a crucial moment when Lions needed just 35 to win with 5 wickets in hand. Three back-to-back wickets jolted their innings and soon they were bowled out for 114 on the board, becoming the runners-up of the first MCL edition.